If you’ve spent any time around Apple products, you know that “compatibility with hardware made by rival manufacturers” isn’t high up on the company’s priority list. But using your iPhone with a Windows PC can be a smoother experience than you might think. The good news is that iPhones are much more independent than they used to be: You can set one up and use it as a standalone device nowadays, without ever having to connect it to iTunes on Windows or macOS. The problems start when you need to get something on your iPhone to a Windows computer, or need to back data up to a Windows machine, or want to do some of the cool tricks possible on macOS—like edit the same document on both a laptop and a phone. There are a number of possible ways to approach this. You can mix and match your own solution depending on how invested you are in Apple’s own apps, exactly what you want to do on your Windows PC, and how tight you want the integration to be. 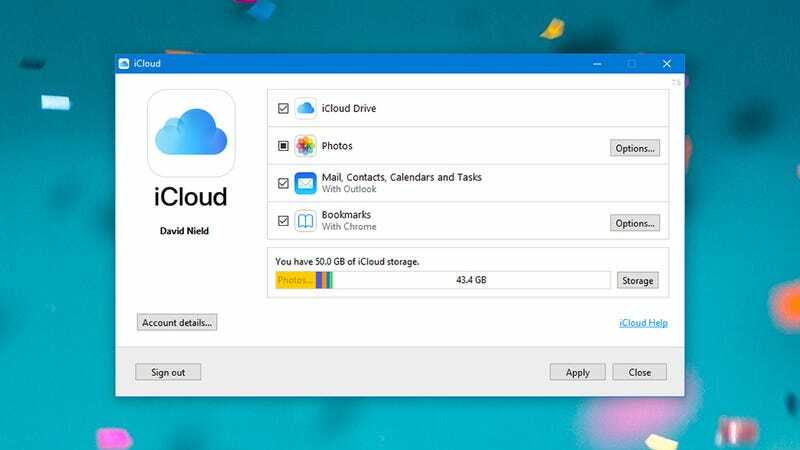 iCloud for Windows is Apple’s olive branch to Windows users, bringing over photos, videos, email, files, bookmarks and more to your Windows machine. It’s not the most comprehensive or feature-filled application out there, but at least it’s an official Apple product that’s semi-regularly maintained. It’s particularly handy if you’re beginning to rely a lot on iCloud for your apps, photos, videos, and files. You can get a lot of the stuff on your iPhone synced over to your Windows machine, so the files themselves are physically saved to disk and available to edit, view, share, or whatever else you want to do with them. When you’ve got the program installed, and you’ve signed in with your Apple ID, you’re then asked which bits of iCloud data you want to sync with Windows. The options include photos, iCloud Drive files, and your emails, contacts, and calendars (which can be synced to Outlook). The setup wizard will even export your iOS bookmarks to Chrome (via an extension). In the case of photos and videos handled by iCloud, you can sync the files on your Windows computer up to the iCloud Photo Library (so they’re available on your iPhone) and sync the files from your iPhone to a folder on your Windows device too. New iCloud Drive and iCloud photos entries appear in File Explorer. This is the easiest solution if you’re heavily invested in Apple’s apps on your iPhone and want everything mirrored over to Windows—all the key stuff like emails, photos, and so on. Because you’re relying on Apple’s software, you can be reasonably sure that everything under the hood is going to work smoothly. Depending on what you need to sync, you might also want to install iTunes for Windows. If you’ve got any kind of local media on your Windows machine that needs syncing to your iPhone, this is the application to use, though in our cloud-heavy and streaming-centric times it’s not as important as it once was. If you want to manage a big music library (playlists and all) from your Windows computer, or you want to watch the films you’ve bought on your iPhone on your PC, or you want a local backup of the data on your iPhone, install iTunes for Windows. 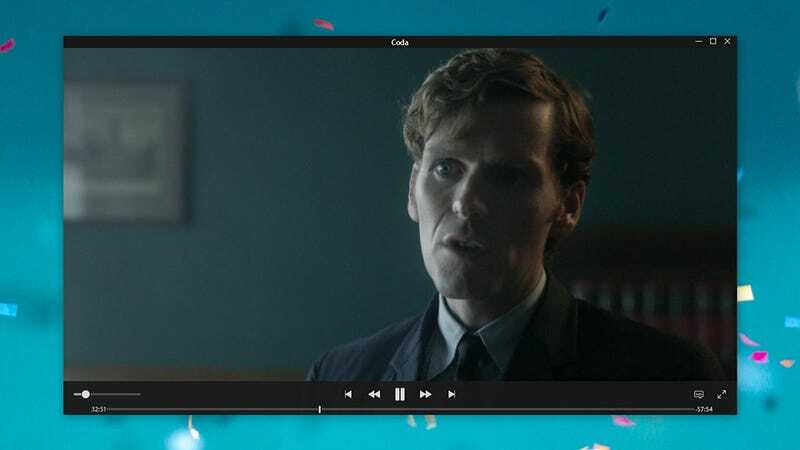 If you use Spotify and Netflix for all your music and video, you can probably manage with just iCloud for Windows instead. iCloud for Windows takes care of a lot of the tricky issues of integrating Apple’s services into Windows programs, but if you want to take a more piecemeal approach—just email, or just calendars—then approach the problem from the Windows side instead. 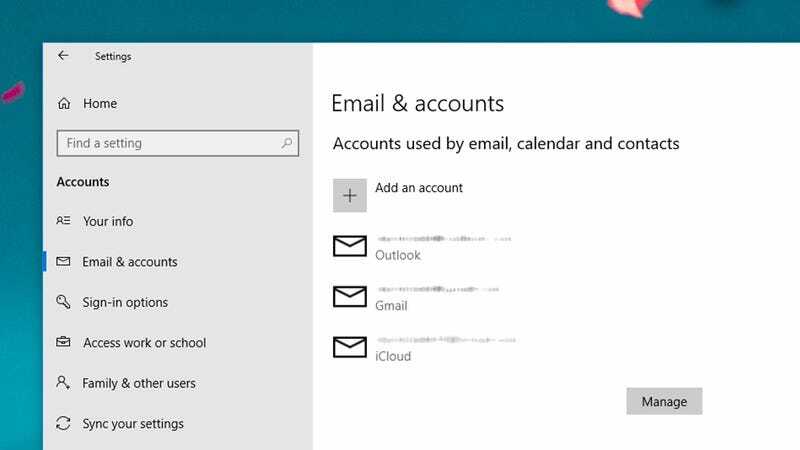 Open up Mail in Windows 10 for example, click Accounts, then click Add account: You’ll notice iCloud is one of the options listed. Sign in with your Apple credentials, and Mail will let you send and receive messages as if you were using Mail on macOS. All of the background technical work is done for you, you just need your username and password. 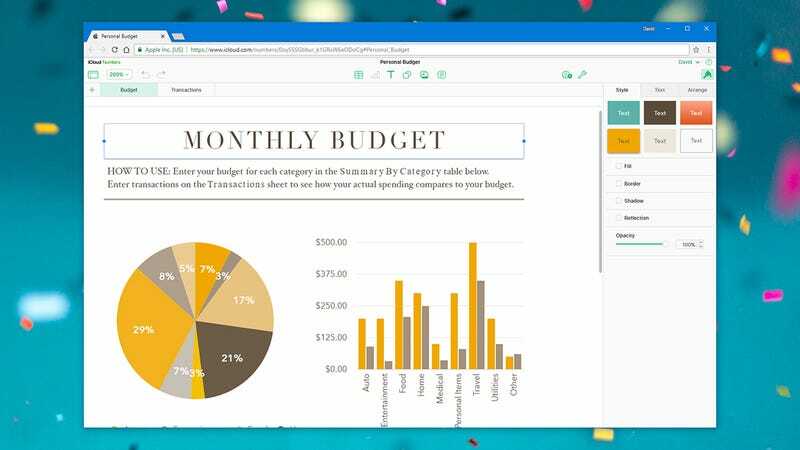 The same trick works in the People and Calendar apps that come as part of Windows 10. If you click the cog icon in the lower left-hand corner of either app, then have a look at your accounts, iCloud is available as one of the accounts to add. 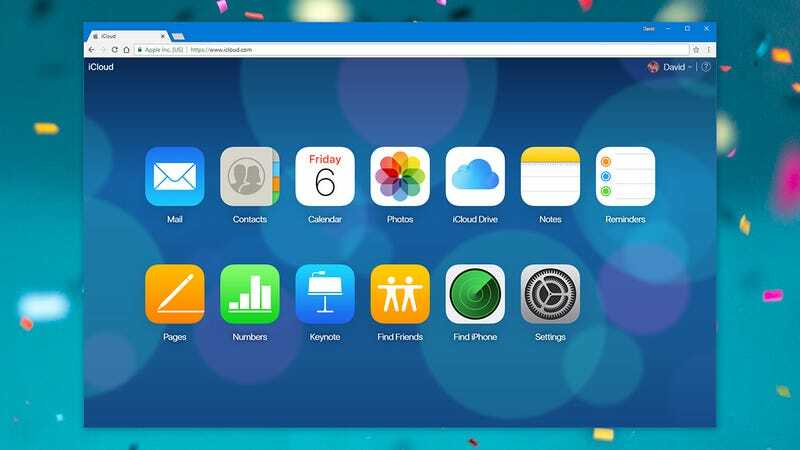 If you’ve already installed iCloud for Windows, this might have already been done for you. You can manage this more broadly by going to the Accounts page in the Windows Settings pane. Under the Email & accounts tab, you should see iCloud listed, or you can add it from here too. To get rid of an account, click on it, then choose Manage and Delete account. This is really a more manual version of the same jobs that iCloud for Windows will do automatically on your behalf. If you want to take more control over the Apple accounts that you see in Windows, and don’t want to install any extra software on your Windows machine, go through the Windows apps instead. Head to the iCloud portal on the web in your Windows browser of choice, sign in with your Apple ID, and you can access lots of the data and files living on your iPhone. For instance, you can load up Pages documents and Numbers sheets, without having them installed in Windows (which is handy, because Windows versions don’t exist). You can read your iCloud email, get at your iCloud Drive files, read your iOS reminders and notes, view the photos and videos you’ve taken on your iPhone, bring up your contacts and calendars, and so on... though you can’t, unfortunately, get at your iMessages (at least not yet). This is a much cleaner option than either of the two options we’ve mentioned above, because everything stays in the cloud and disappears as soon as you close down your web browser. It’s also more limiting in terms of what you can do—photos will need to be downloaded individually, if you want to edit them, for example. 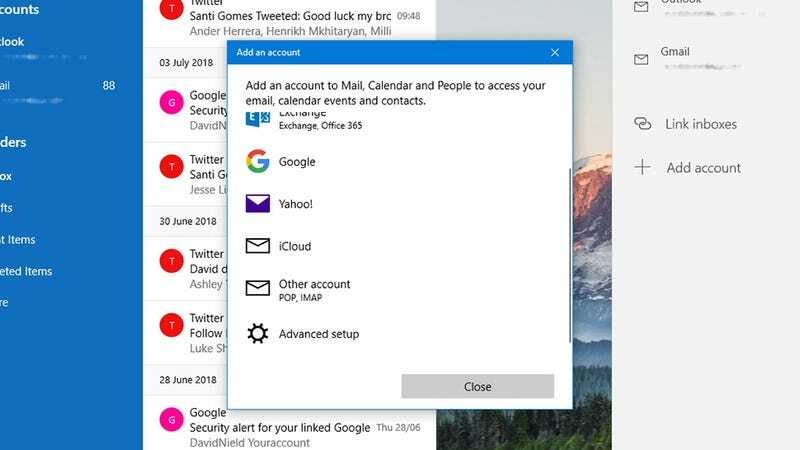 It works best when you want temporary access to something on your iPhone without the hassle of having to add and sync new accounts in Windows, especially in terms of information from calendars or contact lists. It’s also useful if you’re using an iPhone with a Mac and a Windows PC, because you can get at all the Apple apps on the web. You can even use the iCloud web interface to find your iPhone (assuming Find My iPhone is enabled on the handset of course), and for bringing back contacts, calendars, reminders, and iCloud Drive files you’ve deleted in error (click the Settings app from the main menu). Even with iCloud for Windows installed, and your Apple accounts synced up, and iCloud on the web available when needed, some parts of your iPhone are completely out of bounds to Windows (like iMessage, for example, or Apple Maps). Another option is to switch to a whole new set of apps that work well across iOS and Windows—how easy that’s going to be for you will depend on how much you rely on the default apps on your iPhone. Some apps, like Mail, let you get your information out into something else; other apps, like iMessage, don’t. 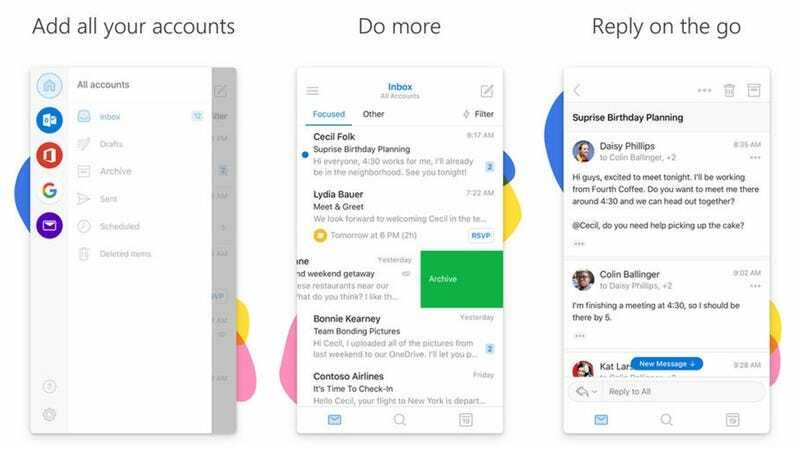 You could take the Microsoft approach, and get Outlook, Word, Cortana and so on installed on your iPhone. Everything will then seamlessly sync with the comparable apps on your Windows devices, controlled by one Microsoft login you can use everywhere. If you’re already a heavy Windows and Office user, and just bought a new iPhone, this is probably a sensible route to take to ensure phone-computer harmony. 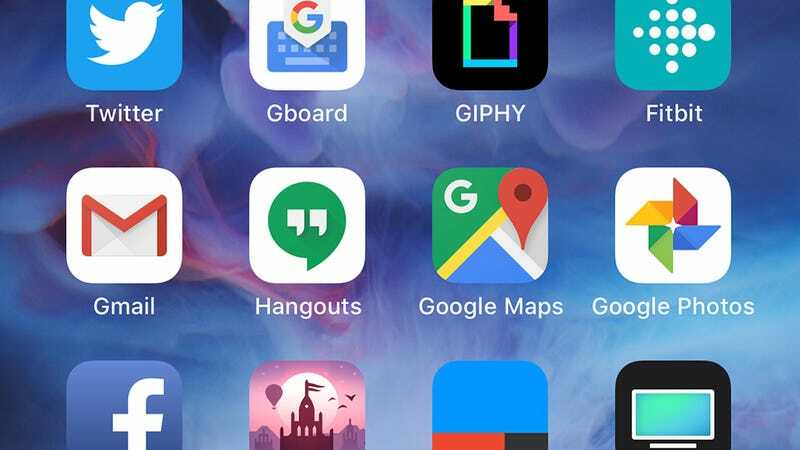 Some of Google’s apps for iOS. Or, you could take the Google approach and use Gmail, Google Drive, Google Maps, and so on. The obvious benefit here is that everything syncs with the web rather than one particular operating system—so you can get at your stuff from Windows, macOS, and even Android if you ever decide to ditch your iPhone. Google Photos is particularly good for jumping from platform to platform and taking all your pictures and video with you. As we’ve said, you’re going to have to tailor these different options to suit yourself and how much data your iPhone is already handling. Between Apple’s programs on Windows, Microsoft’s support for iCloud in its apps, and universal apps, you should be able to get most things working (except iMessage, which remains stubbornly stuck on Apple devices).